Home > And me with my hair like this! Solidarity exhibition organized to raise funds for the INCLIVA (Institute of Health Investigation), and particulary for the Breast Cancer Biology Research Group. The exhibition aims to be an aknowledgement of all those people who rebel, fight against adversity and choose light and colour as a symbol of hope, as well as for the professionals from the Spanish National Public Health System who, with their knowledge and attitude, help quietly behind the scenes. The exhibition consists on a series of pieces with the same topic and format consisting onf drawings on a circular base of old basketry called maurans in the Marina Alta of Spain, the artist´s residence. 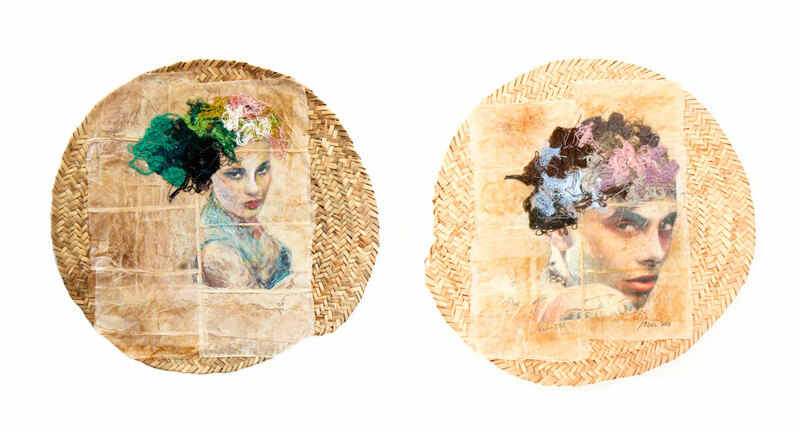 On this bases are sewn various portraits of women made on paper tea bags to which have been added coloured silk threads as hair-do. Media: Basketry (antique maurans), tea bag papers, paint and silk thread.